(Bloomberg) -- South Sudanese leaders will head to the Vatican for a meeting with Pope Francis and other spiritual leaders, weeks before they start implementing a peace deal to end five years of civil war. 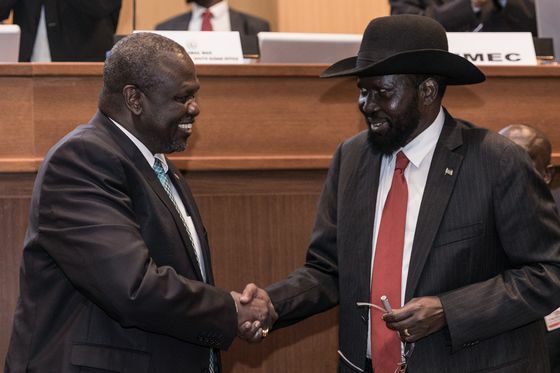 President Salva Kiir and rebel leader Riek Machar plan to travel to the Vatican on Tuesday, according to the president’s spokesman, Ateny Wek Ateny. The meeting, to also be attended by leaders from other churches, will have a prayer session for the country. South Sudan is preparing to be run by a transitional government for 36 months from May. Kiir will lead it, and Machar, his deputy before a rebellion, will be a part of it. The trip comes less than a month after Kiir visited the Vatican, and he asked the Pope’s help to raise funds needed to implement the peace deal. The cash-strapped government said earlier it’s seeking $285 million to support the expanded government. South Sudan’s warring sides signed an accord in September to end fighting that erupted in December 2013. About 400,000 people died and 4 million others were displaced by the conflict. The government is now trying to revive oil production that declined by two-thirds to about 120,000 barrels per day because of the conflict.